VHDX reader supports all versions of Windows 10, 8, 7 etc. 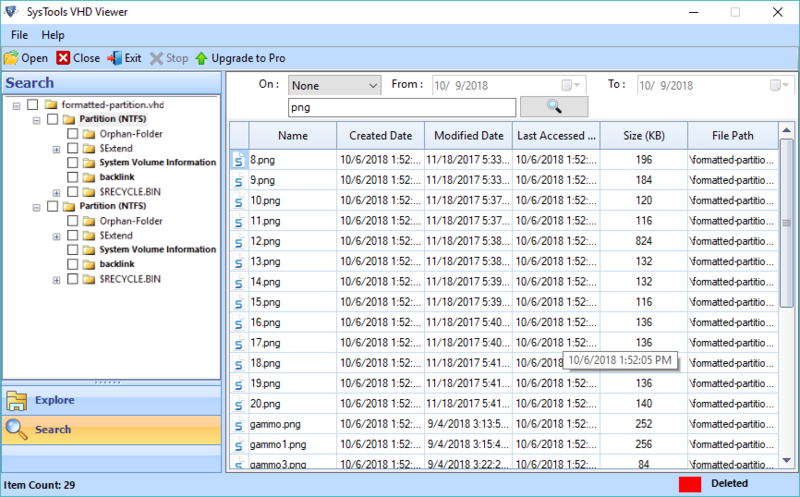 The vhdx reader tool displays all the data saved on the disk image file. The image can be from a Windows Backup, a virtual machine, a failed virtual machine or a Hypervisor server. It can work with a corrupt or damaged VHDX file as well. The software supports Windows server 2008 and 2012. It can work with all Win OS v10, 7 and 8 for both 32 and 64-bit machines. 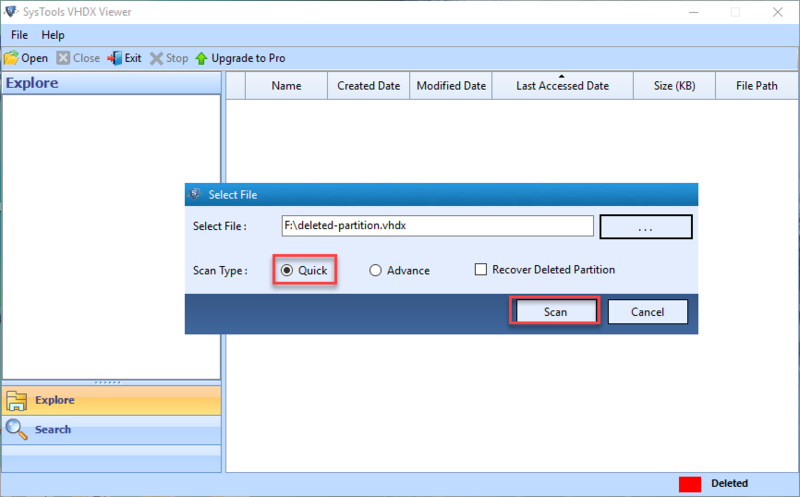 If there is any damage or fault in the VHDX file, the vhdx viewer software is powerful enough to recognize it. It goes on to make repairs to the image file and recover recently deleted or lost data. Recovered items are displayed separately. The recovery option is only available for virtual disk images and not for Windows backup VHDX files. 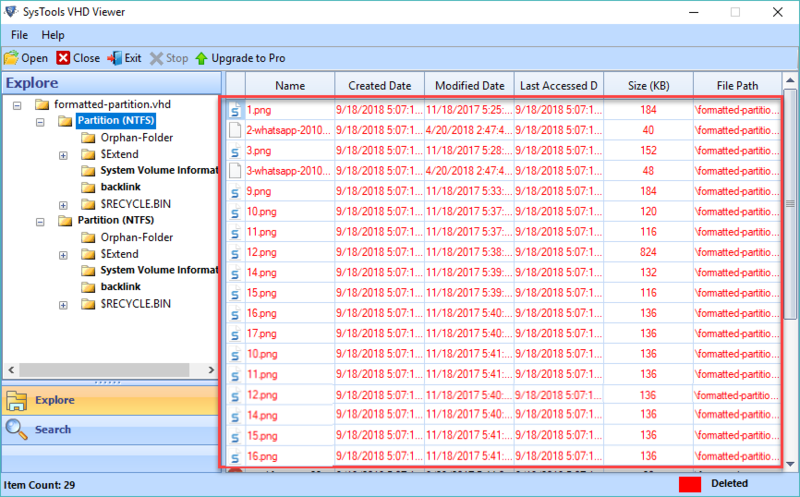 The vhdx file explorer tool can upload a large virtual image file with no size limitation. The code does not break even with large size windows backup vhdx and hyper v vhdx file. As soon as the file loads, a scanning process begins to analyse the disk image. It then enlists complete folders on the left side of the software. 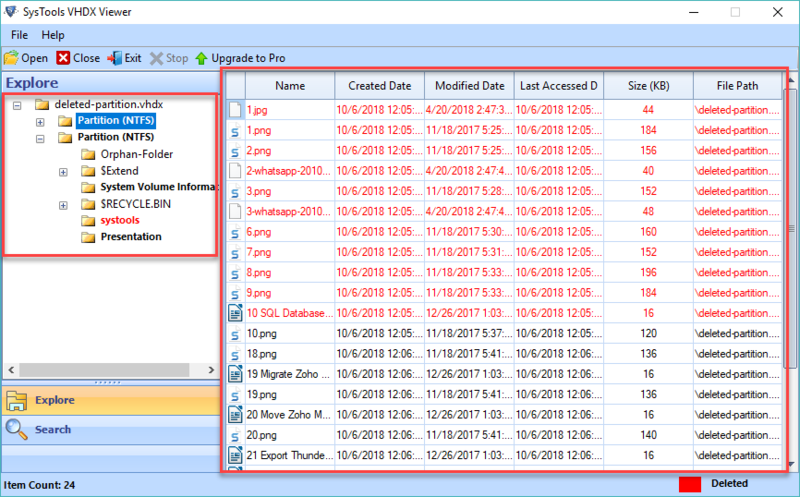 One can click on each folder to explore each file with attributes on the centre pane. There is no way to directly mount a .vhdx image on a Windows 7 computer. This option is only available for VHD file through Disk Management snap-in. This makes it difficult to copy files to and from the virtual disk in case of corruption. The VHDX Opener can help read contents from the disk image on Windows 7 and can even repair it. 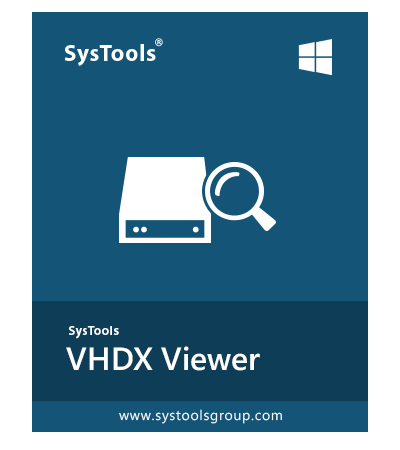 The vhdx file viewer software is designed to work with all versions of Microsoft Hypervisor server. It supports both FAT, NTFS and GPT partition including both fixed and dynamic formats. It can even display data from single or multiple partitions in a virtual disk image. To save time from scanning the disk image again, the tool can save a snapshot of the scan. The VHDX Reader Software is a user-friendly tool with a simple graphical user interface(GUI). It is designed so that even a non-technical user can read contents from a Windows backup disk image. The software ensures that no data is changed during preview. Even the folder hierarchy and data integrity are maintained. It is Virtual Machine Monitor (VMM) which creates and runs virtual machines. It can allow multiple environments to be monitored and managed from one place. A VM (or virtual machine) is a demo of the complete operating system environment. It has its own hardware, software and runs as a real machine. Different environments can exist on the same physical machine with help of Hypervisor. What is the difference between Windows Backup VHDX and Virtual Disk Image? The Windows Server backup tool creates a VHD / VHDX file for archiving. It is same as creating VM on a Hyper-V. The VHDX Opener allows a user to read from both these formats. What is a VHDX file? It is a file extension used by virtual disk image created on Windows 8 PC. It acts as an actual drive but is stored as a single file on hard disk. It contains complete OS for testing and running software that is not compatible with host operating system. What is the difference VHD and VHDX File? The VHD format is a Virtual Hard Disk file that is used for operating a virtual OS for testing purposes. It is the legacy format which was replaced by VHDX with Windows Server 2012 which had more storage capacity. Some old environment like Azure's IaaS still uses VHD format. Then, click on the Open button from the navigation bar. Next, go to the folder path where the disk image of Windows OS or backup is saved and click on Open button. Finally, all the items within the virtual drive image will be displayed with their file attributes. No changes are made whatsoever. "The VHDX File Viewer is an amazing tool. It helped us remove all the corruption from Windows backup file. It even recovered the lost items that were missing for a while. It is a simple but powerful software. It comes with all the functionality to open, read, repair, recover and preview. It is an all-in-one tool that has made our lives much easier. Thanx!" "Our company was searching for a way to view items from an old VM file. It took us days to recover data from the failed computer that crashed recently due to some data recently. We were able to recover 100% of data with complete accuracy. Even the file attributes like the day it was created remained unchanged. Tanks to the vhdx explorer software developer team!!" The VHD Viewer is specially designed to open corrupted, dismounted, detach, and offline VHD files. With this software, users can load and view Windows backup .vhd files instantly. It also helps to view unlimited hyper-v created .vhd files in an efficient manner. 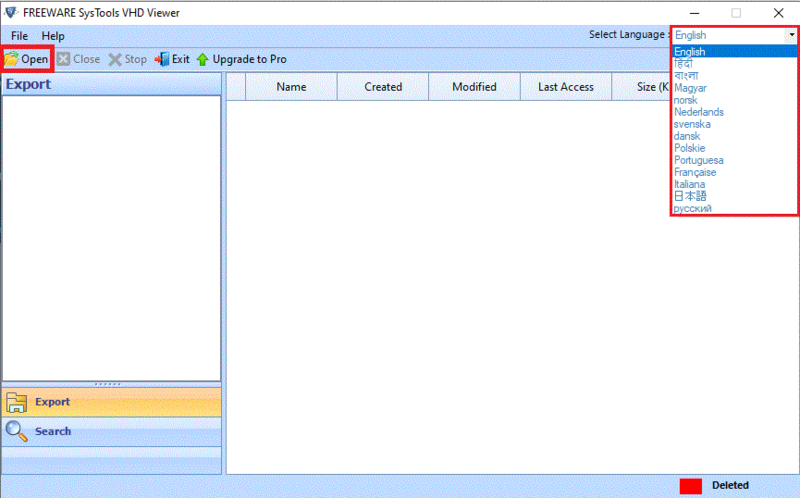 VHD file reader helps to read permanently deleted items from a browsed file and also load them on the viewer window. The deleted files are highlighted with red color and those files can be viewed without any time restrictions. The free VHD viewer is strong enough to let users operate those files, which displays various errors i.e., VHD files is corrupted and unreadable, failed to open 'C:\ vhddir \MyVHD.vhd', cannot attach VHD virtual machine, etc. Users are capable to open and view all VHD files that causes errors when opening them. With the help of VHD file explorer, users can easily view any number of VHD file without any size limitation. Users will be able to browse infinite size of .vhd files and folders that can be viewed easily. The development team to test that product with 45GB of .vhd file and get the successful results. 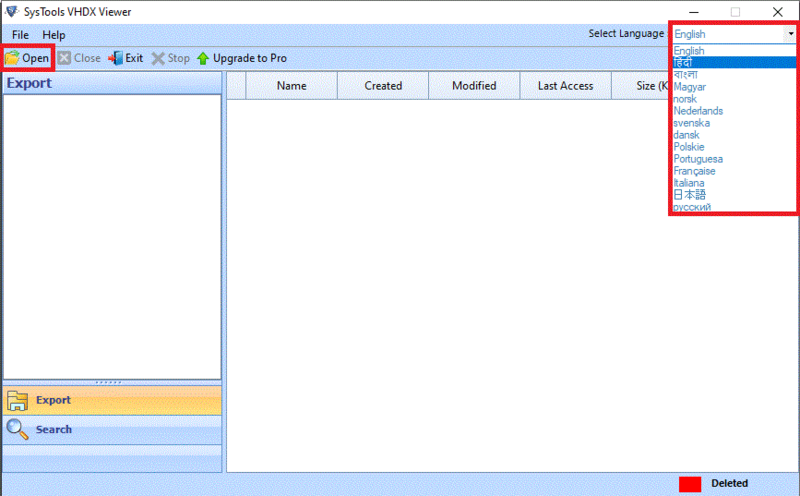 This freeware tool offers a standalone solution, which helps to open .vhd file of any type like static as well as dynamic. It is capable to recognize data from any sort of VHD file. Along with this, the software supports all those .vhd files that have created various applications like Windows backup vhd, Hyper-v vhd, and disk management vhd. VHD file opener is programmed with an interactive interface to expand the data of virtual hard disk. Even a user needs not to be technically expert to open and view .vhd files on a local machine. Both technical or non-technical users can easily operate this software without any pre-requisites. Is it feasible to open Windows backup VHD files whose size is in gigabytes? Yes, Of Course, there is no file size restriction imposed while using Free VHD file reader tool to view data from Windows backup vhd file. 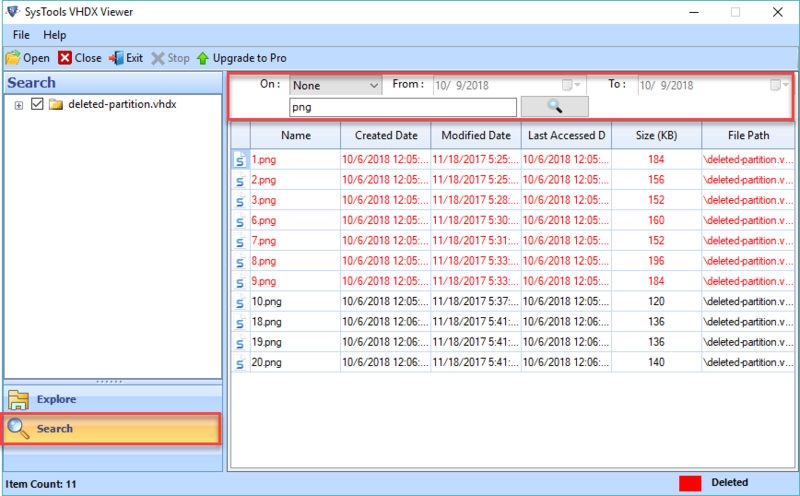 Can I recover permanently deleted .vhd items by using VHD File Viewer software? Yes, you can retrieve all lost or deleted data from Windows backup VHD or hyper v vhd file without any risk using this utility. Is it possible to view offline VHD file of Hyper-V on Windows machine? Yes, with the help of this VHD file Viewer, one can easily view corrupted or offline VHD file on Windows OS. Is there any VHD File size limitation imposed by the VHD File Reader? No, this application does not impose any file size restriction. One can view any size of .vhd file without any difficulty. Does this software help to explore VHD files on Windows 7? Yes, this VHD File Reader software is capable enough to explore Hyper-V VHD Files and Windows Backup VHD File on All Windows platform. After this, click on Open button to select Windows image backup .vhd file or Hyper V VHD File. "Since last 2 months, I was unable to mount and open VHD files. This problem occurred due to sudden failure of a virtual machine. But, when I used this VHD Reader software I was so impressed with the functionality of this great tool. Now, I am able to read and explore VHD file. Hats Off to the development team for creating a trouble-free solution." "The best part that attracts me to use this software is it provides option to view permanently deleted Vhd files without any restriction. Moreover, it is an independent utility that does not require any supportive environment. Even I never thought that viewing VHD file is so easy with this free VHD File Viewer. Truly the best solution I have ever come across. Great work!!"